It’s been a busy time for me and I missed last week’s AdventureNotes. And although this week’s article is late, I’m going to make it up to you! This week’s AdventureNotes is about Birmingham. It is the city where I live in now. I’ve lived here for more than six months now and I can find more and more interesting places to visit. Birmingham is the second biggest city in the UK. It used to be an industrial city where car manufacturers do their production. Indeed, it becomes a quite busy city until these days. People come here for business, but less for tourism. Yes, as it is more perceived as a ‘metropolitan’ city where people trade and conduct business, it has less tourist attractions. There are more office buildings and shopping malls. Having lived in Birmingham for more than six months makes me realize that this city grows rapidly. There are more building developments each day, a newly opened apartment, a construction for a new office center, and a new mall. I feel almost like it’s growing to be Jakarta. Indeed, I think this city has so many shopping centers spread throughout the city. 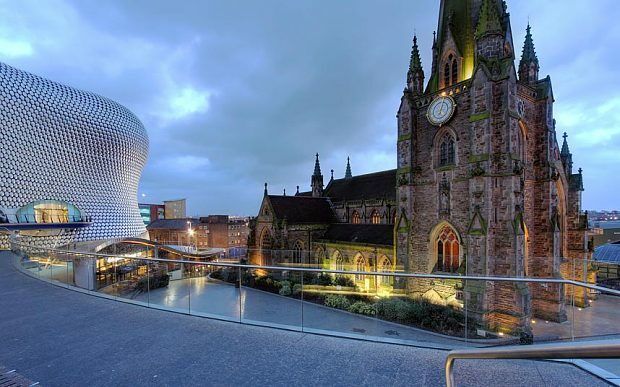 Birmingham itself is big with different areas with their own village centers and attractions. I haven’t had a chance to visit all of them, but here are some that I would recommend. There are many ways to enter Birmingham. The most common one is of course by train. When you arrive in Birmingham, you will most likely arrive in Birmingham New Street Station. It is a newly built facility, just opened by Queen Elizabeth II a few months back. It is such a modern and iconic building just in the middle of the city center. Besides functioning as a train station, the building is also a shopping mall called Grand Central. It is almost like PIM in Indonesia as this shopping mall is connected with another shopping mall. The place is always bustling with people, even in early morning. Birmingham has two other big train stations, which are Snow Hill station that is located within Birmingham business district and Moor Street station that was once the central train station in Birmingham before it was moved to New Street Station. The architecture in Birmingham Moor Street station is unique and preserved to maintain its characteristic during the old days. As I said, Birmingham is a city with so many shopping centers. Walking in the city center, you can see different kinds of markets, shopping mall, and shopping area. Besides the Grand Central, another bigger and more iconic shopping mall in Birmingham is called the Bullring. It has been a Birmingham icon for a long time. It is actually a regular shopping mall with unique layout. I really think that the first time people visit this place, they will be lost. Haha. I quite like the surrounding area of Bullring. There are outdoor market where people trade fruits, vegetables, etc., indoor market to sell meat and poultry, rug market where you can find just anything, literally anything, and the streets nearby where you can find individual stores. Walking along the city center is quite nice, really, just hopping from one shop to another. Birmingham is not just about shopping spree. My favorite place in Birmingham is its Canal Side area. We can walk near the canal, looking at bars and restaurant alongside. Near the canal, there is an area called the Brindley Place where there are restaurants, gardens, and a gallery called Ikon Gallery. I like to visit Ikon Gallery because it is quite unique. It offers different independent exhibitions throughout the year. The garden there is nice and calming. The area is surrounded by tall office buildings, but I can just feel the serenity. Opposite the Brindley Place on the canal side is ICC. It’s a convention center where people see performances, exhibitions, and conferences. Walking through the ICC towards the street, we can see Centenary Square. The annual Birmingham Weekender closing performance is usually held there. Last year, the festival ended with an acrobat performance that was magical! Be sure to visit the city during the event. In the area near Centenary Square towards the Victoria Square, we can see the Library of Birmingham that is shaped like a wedding cake, the Town Hall, and Birmingham Museum and Art Gallery. Those are the usual places to visit. At the top of the library, there is a Shakespeare memorial room where we can see the city from above. There is also a sky garden where we can have a nice chat outside, on the 7th floor of the building. The library itself is massive! I love coming inside to just look around. The place is so comfy and sometimes there are also exhibitions held there. The library is indeed a very nice place to visit whereas in my opinion, Birmingham Museum and Art Gallery is kind of a so-so place. The layout is rather outdated compared to other museums in the UK. An area of the city that is rather less explored is the Jewelry Quarter. It is located rather outside the city center, but not too far away. The area is full of jewelry shops where people can window shop (literally through their windows), looking at different jewelry offered. There is also a museum there, but it charges an admission fee around £10 per person. I basically haven’t entered the place because of the fee, but I think it will be quite interesting because we can see the process of jewelry making as the place was once a jewelry factory before it was changed into a weapon factory during the World War II, and now it serves as a museum. Less people know it before they arrive in Birmingham, but the city was once lived by Cadbury – yes, the founder of that Cadbury chocolate. Therefore, one of the attractions of Birmingham is the Cadbury Experience. Located in a village called Bournville, which was really founded by Cadbury himself, the attraction offers a full experience of chocolate making and its history in the world. There are fourteen different experiences offered by the place, along with its so-called biggest Cadbury shop in the world and a tea room. The admission fee to enter the place is not cheap, but will certainly worth it. However, you need to be careful because you have to book the ticket online as the place is so popular that sometimes there is no slot available for you to visit, especially during the school holiday. One of the things that attract people to come to Birmingham is its university. Put among highly ranked universities in the world, University of Birmingham does not only offer a good quality of education, but also a place to visit. The university area is famous for its clock tower called the Old Joe. The clock is so high and big that a double decker bus can go through its clock face. The university complex is quite interesting to visit and has its own tourist attractions, such as the Barber Institute, which is the university’s art gallery, and the Winterbourne Garden that attracts people for its beauty. The Valley area, where the university accommodation is located in, is also interesting to explore. The annual bonfire night of the university is held in the Valley. The last attraction that I would recommend to visit is called the Black Country Living Museum. Located outside the city center, particularly in Dudley, the museum is very unique. The full review of this museum can be found here: https://theadventureofizzao.com/2016/03/25/black-country-living-museum/. Be sure to visit this place when you are in Birmingham because the experience is like no other. Indeed, we can learn many things from how people manage this museum. The place is very educational, yet not boring. For me, a very nice aspect of exploring Birmingham is the food. Yes, the food. There are lots of different food stalls offering different kinds of food. Especially for me, who is a Muslim and have to eat halal food, the city is full of halal restaurants. I can find halal Japanese restaurant, halal Chinese restaurant, and the common fast-food joint serving halal food. I love it! There are so many delicious food offered with a very reasonable price. It is not difficult at all to pamper your stomach in Birmingham. As I said, I haven’t explored the whole city, yet. Yes, despite of my months living here, Birmingham is indeed a very big city. I will certainly have to write some more about Birmingham later on when I have visited some more places. See you next week!